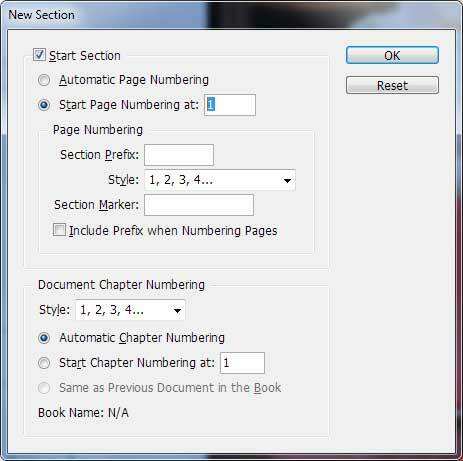 When you use the A-Master and add auto-page numbering, InDesign counts each page from the very start of the document. If you have a cover at the start of your document, you may have one or more pages where you do not want the pages numbers to appear. Since the page numbers don’t appear on these pages, you probably don’t want them counted in the page numbering sequence either. This tutorial will show you how to adjust your page numbers so you can have them starting where you want. Above is my document before I made this tutorial. You can see that I have a cover page with no page number on it, but the actual numbering starts with number “2” on page 2. What I want is for the page numbering to start on page 2, but instead of saying “2”, I want it to say “1”. Note: suggest you do this process only once you are happy with the final layout of your document, as it does require you to turn off shuffling of pages. 2. 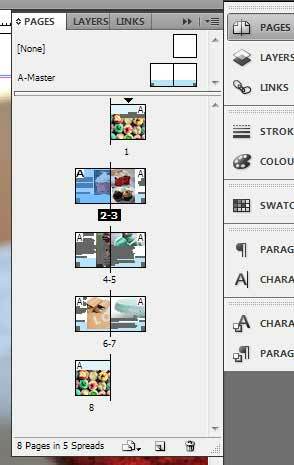 The Pages palette has a menu you can access from the button on the top right of the panel. This gives you more options. 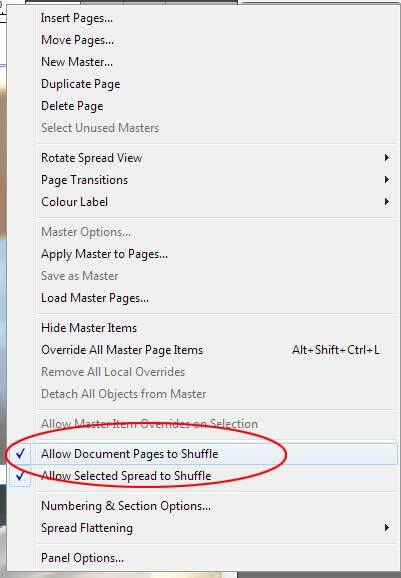 Uncheck the option Allow document pages to shuffle. 4. 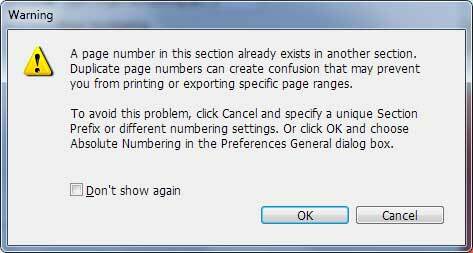 Select Start page numbering at and set the number in the box to be “1”. This will work with either a left- or right-side page (i.e. you can make an “even” left-side page into page 1. Nifty! 5. You may see a warning screen appear. It’s simply telling you that some of your pages will have identical page numbers. We will fix this later. For now, just click OK.
6. Your page numbers should have automatically renumbered. Apply a different master page which doesn’t contain any page numbering, such as the master called “None”. 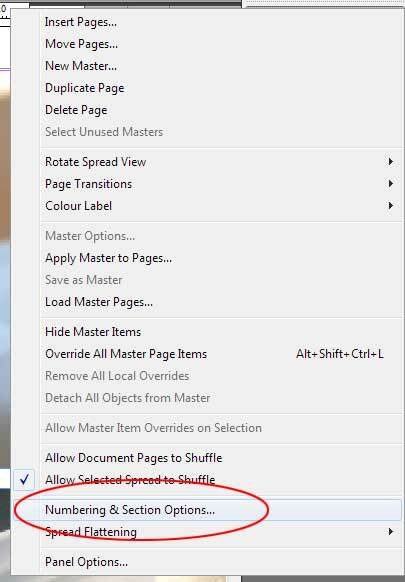 To do this, select the page you want to apply the different master page to, and click the Pages palette menu button. 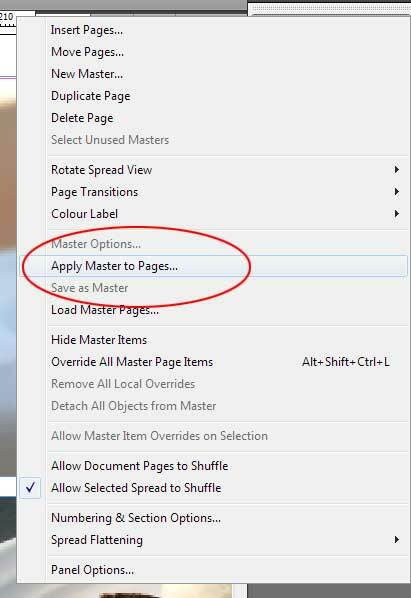 Choose “Apply master to pages…” and then choose the master page you want to use instead of A-Master. 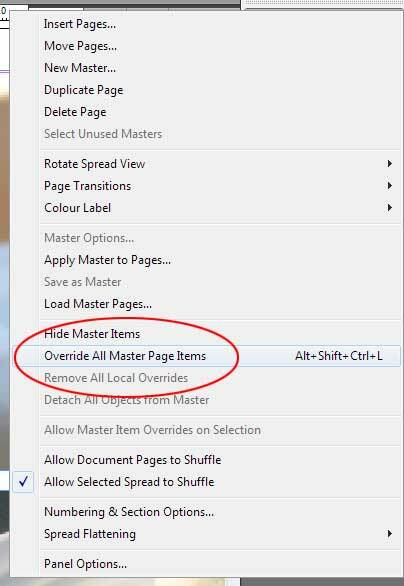 Or, you can go to the Pages palette menu, and select Override all Master page items. This will unlock the items from the master page, so you can then select and delete the bits you don’t need, such as the page numbers. Basically it’s telling me it can’t apply the master page I want, because there are 2 x “pages 1”s in my document. 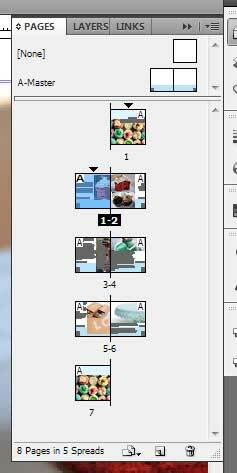 InDesign is confused! Poor lil’ InDesign. To fix this all you need to do is rename one of the “page 1”s. To me, it makes more sense to rename the cover page 1, because it’s not included in any page numbering sequence. Go to the Pages palette menu and select “Numbering and section options”. 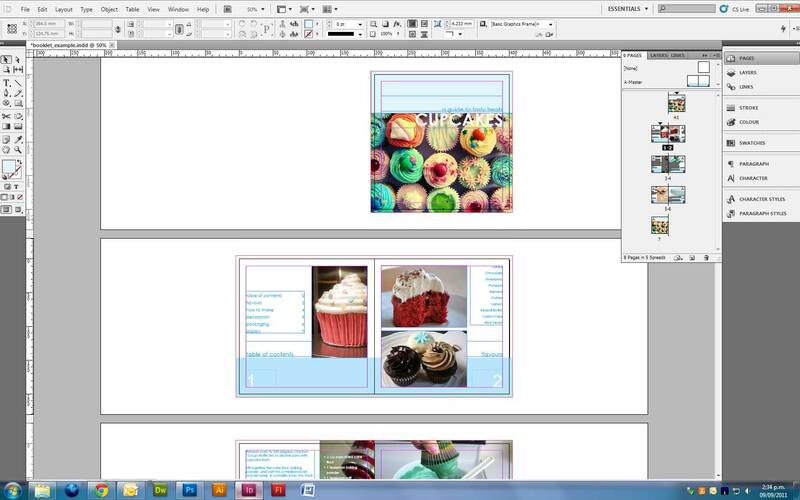 I added a Section Prefix of “A” so InDesign could distinguish between pages A1 and 1. 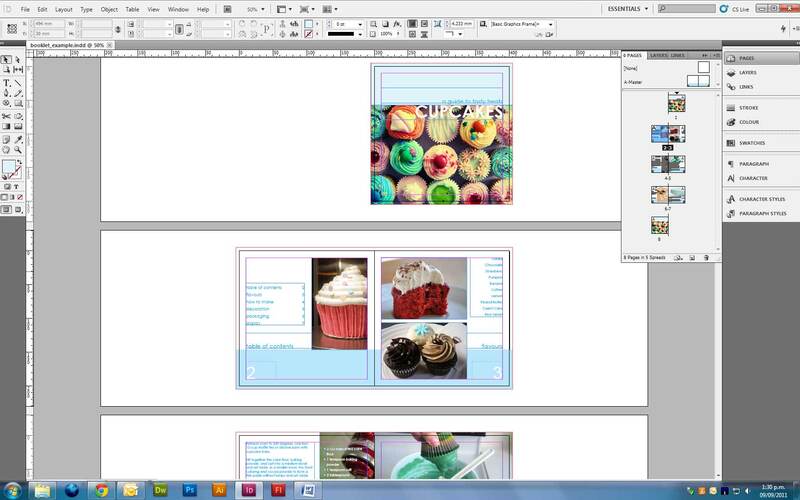 After doing this InDesign will let you change the master page of A1. Thanks, I’ve been trying to figure this out for nearly two hours. Yours was the most helpful tutorial I’ve found! it actually works!!! thanks! i’ve been trying too to figure this out for many hours with no result!! indeed the most helpful tutorial! After much weeping and gnashing of teeth I stumbled across this. Works perfects! Thanks!! WOW!!! This is simply amazing and simple step to follow. Thanks, i’ve try to figure this out for half day work haha! This was great! Thanks for blogging this, I’ll be saving this because I’m sure I’ll forget how to do it every time I need to! Crystal clear! Thank you a lot, mister! thank you for the clearly stated & immediate help. much appreciated! Thanks so much! I am now working in CS6 and was completely frustrated with this issue. Done! Many thanks. Struggled even to find something on this issue, and I think I couldn’t have done any better. Works like a charm. Thanks Dorothy 😀 Yep I made the tutorial precisely because I couldn’t find very much info on this topic. Thanks for your clear instructions. This really helped. hellooo, i tried this out!! and it really works (Numbering) !! Problem Statement 1 : Failed to Export the PDF file. Thank you!! This was the clearest tut on the page numbering topic I’ve ever seen. You saved me from tearing my hair out. Again. Sorry I can’t really help with that without seeing your document. Thank you Philippa, for your very clear tutorial. You have saved me a lot of time! thanks for the tutorial! Really helpful and easy! Hi Janet, sorry I am not sure what is happening with your document, without seeing it myself. I hope you have found a good solution. Thanks Philippa. I did find a solution: yesterday I upgraded to version 6 after a colleague using the latest version was able to get the page numbers for the book correct. An expensive way to go, though! This was super-helpful, thank you! I am following, but after I change the the start section to page 2 under the numbering and section options, nothing changes in my document. anyone know how I can resolve this? I’m not sure without seeing your document. Thank you so much! Very clear instructions! Ha! Great! Thank you so much!! Having had troubles with auto numbering & CreateSpace guidelines. Goggle search > You: solved my problem in 3 minutes. Thanks a ton! Thank you very much it is very helpful for me. I’m trying to figure out how to allow the page number to show in front of a placed image on the page in the background. I can’t find a way to make the page number come to the front. Half my page numbers are missing because of images placed. Very helpful page. My problem is with a document that has 2 section. One that binding goes from right to left and another section that binding goes from left to right. How do I set up the document that each section starts and ends with its own page number from 1 to …. It this at all possible? Thanks Javad. That sounds like a very interesting document! So, one part has the binding on the left like normal, and one part has the binding on the right, is this correct? It is possible to re-start the numbering of the page numbers, however the binding swapping might be a more interesting challenge. I would take the easy way out and just create two separate documents, then combine them afterwards!